I first met Diana at the Louvre a few years ago. The statue is breathtaking in person. 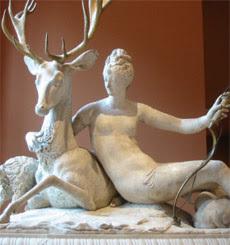 Diana was the goddess of the hunt in Roman mythology. Many masterpieces, in art and poetry, have been inspired by this figure representing strength, beauty, athletic grace, and hunting skill. Once again, I was reading one of my favorite picture books, Isabelle and the Angel, to Levi. A blurred image of the Diana the Huntress statue gazed up at me. In the book, Isabelle the pig is a little afraid of the statue. It makes her feel small. Isabelle and the Angel is a beautiful book with strong, rich colors. Isabelle loves to make pretty paintings with pink cake and strawberry jam. She also loves to visit 'the Museum' where she sits in a red velvet chair. The Louvre is not mentioned by name, but the telltale glass pyramid is situated in front of the museum, and the Mona Lisa hangs upon a wall. I heartily agree. It belongs on the special shelf.